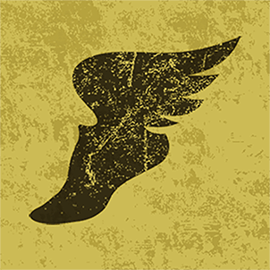 Hey Calgary Marathoners! Meet your 3:15 pace bunny! 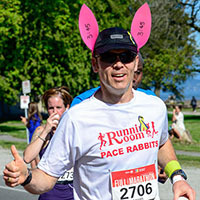 Pace Bunny Motto: Run smart and finish strong. Pace Bunny Plan: I like consistency, so ideally, I’ll be aiming to run even first- and second-half splits. We won’t be doing walk breaks, so I’ll be running around 4:37 per kilometre or 7:26 per mile pace. Stick with me the whole race and you’ll get in under 3:15. Feel free to spend time running with me en route to — or on your way back from — something more adventurous. Just look for the bunny ears and you’ll know you’re on 3:15 pace. I’ll be there for you. I can offer moral support, bore you with stories about my previous running experiences and even suggest when it’s time to take a gel, but ultimately finishing the marathon is up to you. If you find yourself struggling and unsure of whether you can keep going, ask me to tell you about Western States. I live in Vancouver so I won’t claim expert knowledge of the course (although Google Earth has been a great help). 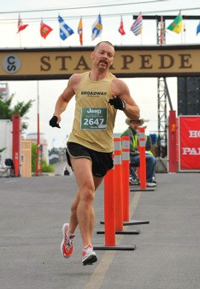 There are a few similar stretches but the current course is largely different from the previous Calgary Marathon I ran in 2006, so I may stop at the occasional gas station to ask for directions. Just kidding. I’ll carry a map. I am coming from sea level though, so I may stop to catch my breath. Again, just kidding. Pace Bunny Scouting Report: I have a tendency to finish slightly ahead of schedule. Other Pacing Experience: If you’ve got some free time, let me tell you about Fat Dog. Alberta Sports History Fun Fact: I captained the Alberta Junior rugby team to a bronze medal at the 1987 Canadian Championships in St. John’s, NF. I was a little nervous flying into Calgary amidst a miserable storm but we had fantastic conditions for race day: cool to start, sunny, almost no wind. I had a great time running with some great people and finished in 3:14:03. Thanks Calgary! Previous Previous post: The Course Was Long!